Do you like to see London from a different side? How about cruising down the Thames with London Rib Voyages in a speedboat? This 360 video was shot by Henry Stuart from Spherical Images on a clear but very cold day in December 2012. The 360Rig was mounted on the end of a 1.5m carbon fiber pole. Despite the vibration from the boat and the waves the footage is remarkably smooth. Take a look and enjoy feeling like 007! 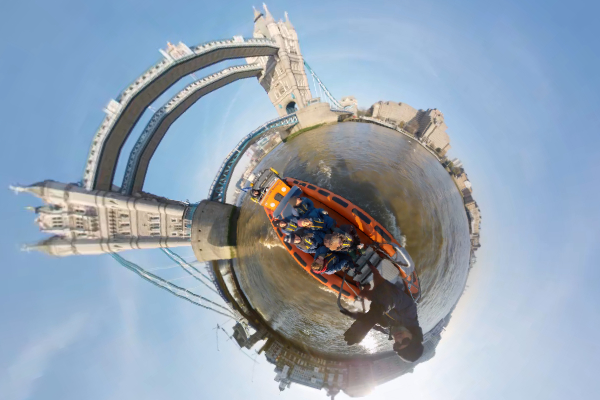 This entry was posted in 360 Videos and tagged 007, 360Rig, Henry Stuart, London, speedboat, Thames, tourism, urban tour. Bookmark the permalink. The Freedom 360 allows you to use your own six Hero3 cameras (white, silver or black) to record six video stream that can be stitched into a full spherical, equi-rectangular video. The original and innovative geometry gives you the freedom to hold the rig in any direction, no nadir blind spot to worry about. Capture everything around the rig, without obstructions. C/ Méndez Nuñez, 31 Dcha. The upper part of the NN Pole Series 1 is a great accessory for the Freedom360, allowing a wide range of otherwise impossible shots.